The Woman is smitten by a kitten. OK, those words aren't strong enough. TW is in LOVE with a grown cat, whose initials aren't CK. 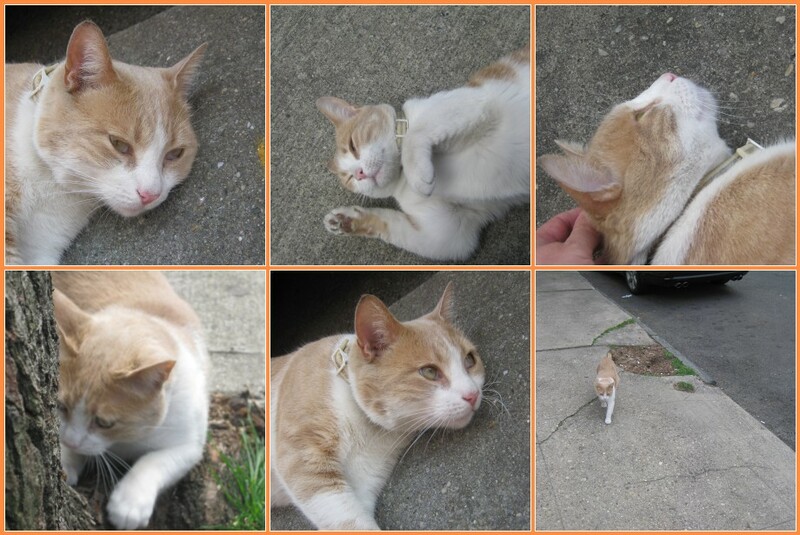 His name is Buster, but in the Alleys, we called him P Kitty Chuang. He's another member of my posse, along with Jamal Jonez, who you met a few weeks ago. When TW first saw P Kitty, she thought he was a homeless stray. He was so fat, she thought he was a she and she was preggers. She'd bring him food and pet him. Then she found out, he lived in the deli, which is owned by Chinese or Korean people and he started wearing his collar. He's also shed his kitten fat and is now svelte. To say P Kitty is a lover is an understatement. He's not stand-offish like Jamal. You could say he's an attention whore. TW goes out of her way to pass the deli when she goes out in hopes of seeing P Kitty. She's even mentioned a few times that if the deli owners spoke a little more English, she'd ax them if they wanted to trade cats. Now how rude and inconsiderate is THAT! That's what I have to put up with and I'm not happy about it. For the first photo shoot, he had just come around the corner, on his way to hang with Jamal, when TW spied him. She called and he came running down the block. You can see him running to her in the last photo. In the third photo, you can see her giving him scritches. Yes, this little ghetto cat is up in arms about it. Then TW realized he had to cross the street to get from his store to Jamal's place so she got worried. Now she's all nervous that he's gonna get hit by a car but P Kitty can take care of himself. The many faces of P Kitty. He's a real sweetie who's wooed TW. Poor P Kitty has hairball issues. Yes, you could say he needs a P Kitty Comb[ing]. HAH! Every time he lays on his back so TW can give him belly rubs—I know, how disgusting is THAT!—he starts coughing. Yeah, TW giving him belly rubs is enough to make ME toss my cookies too. At first she was ascared to give him belly rubs cos she thought he'd bite her like a certain other kitteh she has. She keeps threatening to bring one of MY combs with her so she can get rid of his loose fur. She mentioned today he felt soft and silky so someone not named TW must've brushed him. She also wonders about whether he's been fixed or not. When she first saw him, the alley near the deli certainly had the strong perfume of Eau de Male Cat. Today, she got a look at his "male parts" and was surprised and delighted to notice that he's been all taken care of. It had occurred to her that she couldn't very well talk to the owners about it. She didn't know if their culture believe in spaying and neutering but now she doesn't have to worry about little P Kitties running around homeless. All this brings me to a story. When TW was younger, she catnapped two of her then upstair's neighbors' cats because he wouldn't have them fixed. She and her friend took them to be neutered. She figured the neighbor wouldn't be the wiser since they often stayed out all night, looking for a hot date. She also knew the v-e-t who was going to perform the surgery because he'd performed it on Gramma's Nicky. Nicky wasn't shaved so she figured he'd do the same with Tippy and Freddy. Unfortunately, they were black tuxies and they were shaved "from stem to stern," as the story goes. The neighbor was on to them as soon as he saw his cats but forgave them since they saved him money. Years later, he eventually had Rusty and Hope neutered too. I hope my furrends enjoyed meeting P Kitty. I'll bet he's the best mouser that deli ever had! Well he is a handsome dude and I am sure he knows the mousing biz! I enjoyed meeting P. Kitty very much! Thank you!!! He's quite a good looking boy so I can see why your mom likes him so much but this talk of 'trading cats' well.... it's just NOT right! I don't think you have to worry though 'cause now that his people have had him neutered and whatnot, they'll want to keep him and love him up for sure. He sounds like a great guy, glad that TW gives him some attention and some decent tummy rubs! P Kitty sure is good looking cat. He looks just like the one my daddy had when my mom met him. Maybe TW can take you out for a walk and you can meet him! Ok, we can't stop cracking up over the *stem to stern* reference. hahaha! CK, don't worry. You are safe. Pops would never let TW TRADE YOU IN. I feel your disgust though. Gloman is always talking about a trade. ....with all I do for him! P Kitty is too cute. Glad TW is being so nice to him. He looks like such a nice kitty. Don't worry, TW won't trade you. She couldn't stand life without you. Great pictures. Hope all of you have a great day. Awww he's is a very handsome boy. It's a good thing you have been "fixed" CK or I'd have to worry about rhe tow of you. I was hoping that cute little guy could become your new brother!! P Kitty sounds pretty awesome! I would not worry too much, CK - your human is still coming home to YOU! It's good he got brushing...hairball is not fun. And it's so nice he is getting lots of attention from TW. Again, don't worry, you are always her #1!! He is handsum and we LUf his name! I can see why you love "P" Kitty, he is adorable! P Kitty sure is handsome. Wouldn't it be nice if he could come live with you, CK?? Dear CK, PK may be handsome, but me thinks yous has nothing to worry about. Mommys is notoriously fickle (at least my Mommy is) when it comes to cats. My Mommy lives to pet every cat she sees! Me wants to thanks yous for your purrs! Me is feeling better. Thanks for the reminder CK--I added the linky to today's post! Meowmeowmans said it purrfectly..you are irreplacable. And btw, I'll never tell that secret you told me today in the comment. My kitty lips are sealed.